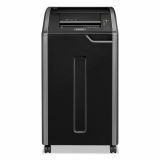 Fellowes Powershred 425Ci 100% Jam Proof Cross-Cut Shredder, TAA Compliant - Powershred C-425C features a Jam Proof System that eliminates frustrating jams by preventing overloads and powering through misfed paper. 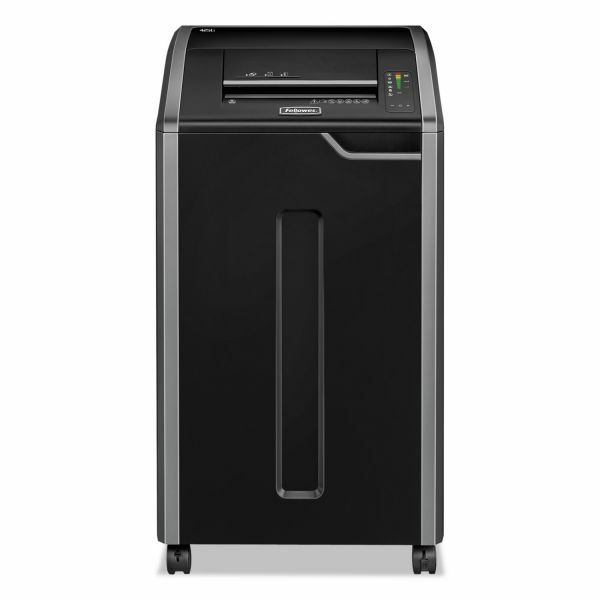 Superior shredder for offices of 10 or more users. 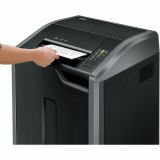 Time-saving, sheet capacity indicator measures paper as you shred to ensure maximum capacity at every pass. Auto-Oil coats the cutters to enhance performance and extend shredder life. 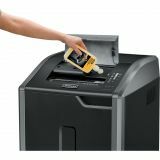 SafeSense Technology stops shredder immediately when hands are too close to the opening. Heavy-duty 1.9 HP motor shreds 24 to 26 sheets per pass into 5/32" x 1-1/8" cross-cut particles, shredding 14' per minute. Durable steel cutters accept credit cards, staples, and small paper clips, while a designated safety slot accepts CDs. Wide 12" paper entry allows continuous feeding of 80-column paper. Includes a 32-gallon pull-out wastebasket for easy waste disposal and auto start/stop shredder operation. Shuts off automatically and alerts operator when wastebasket is full or door is ajar. Door offers a holder oil, manual, and shredder bags.